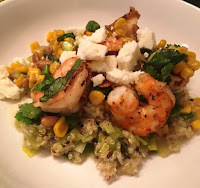 Lovely summertime dish that is a nice take on traditional 'shrimp and grits.' The white quinoa was interesting . . . with the garlic, chicken stock and leeks adding nice flavor to it. I'll make the quinoa that way any day!